The theme of this post has been percolating in my mind for a few days. I believe that most of my readers recognize that I am a Mormon, a member of The Church of Jesus Christ of Latter-day Saints. 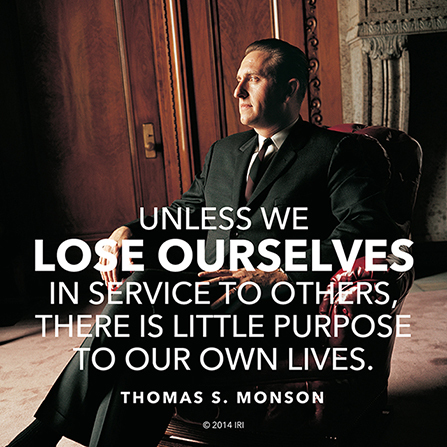 This past week, Thomas S. Monson, the prophet and president of the church, passed away. I am, of course, saddened that I will no longer be able to hear him speak at future conferences, but I also recognize he had been failing in health and now he can be reunited with his dear wife, who preceded him in death. I also know that church leadership continues to run smoothly and a new prophet will be called soon. While I know that some of my readers are also members of the LDS church, I know that many are not. From comments you have made on my blog, to private conversations we have had on Facebook or via email or text, I appreciate the sincere questions and respect that has been given. You are proof positive that it is possible for people to disagree on deeply-held beliefs--religious, political, social, or other--and yet be friendly, kind, and courteous. A difference of opinion does not negate friendship; when we seek the admirable traits in each other, our lives are enriched. Understandably, when Thomas S. Monson died, media outlets took note. Most of the reports were as one would expect. NPR tweeted, "Thomas S. Monson, president and prophet of The Church of Jesus Christ of Latter-day Saints, has died at the age of 90." CNN reported, "Thomas S. Monson, Mormon church president, has died at his home in Salt Lake City, Utah, according to a statement from The Church of Jesus Christ of Latter-day Saints." Politicians from both sides of the aisle also took to Twitter. Al Gore wrote, "I send my condolences to the LDS Church and to the family of its leader, Thomas Monson." The White House issued a statement: "Melania and I are deeply saddened by the death of Thomas S. Monson, a beloved President of the Church of Jesus Christ of Latter-day Saints." All of those statements were respectful and to-the-point. Another major newspaper took a different approach, tweeting not just the fact that he died, but spending precious characters defining his service in a negative light. This publication's main gripe seemed to be that the church did not change its doctrine during President Monson's tenure. I understand that not everyone holds the same beliefs, but I'm saddened that a report of a death took a negative slant. This Ten Things of Thankful post will be my response to that newspaper's negativity: positive counsel given by Thomas S. Monson--counsel I am thankful for, that I think applies to us all (regardless of religious affiliation), and advice which I strive to obey. 6. President Monson had a gift for storytelling. This next item is a video clip, so you can appreciate his talent, as he teaches the concept of "judge not." 10. Finally, I'll end with another video clip. President Monson leaves behind a legacy of service, and this clip shows how his example has spread. Did any of those quotes ring true to you? What are you thankful for this week? Please join us at The Ten Things of Thankful blog, and link your own post. Excellent and wise words. My condolences to his church and family. Can there be any better relationship among/between people. No one expects all to agree on everything, but to offer the respect we would hope to receive from others is surely the right path. Wise man, your President Monson. I am sorry for your loss. This was a wonderful tribute. I am Catholic, but most of them ring true for me. Our churches have worked together before in relief efforts; kindness and charity know no boundaries. Beautifully said, Kristi. I remember how much you kids looked forward to hearing him speak even when you were quite young. His many stories captured the attention of all, and they were perfect for getting the point across. It was even greater was that so many of those stories were based on true experiences. He had many great experiences to share!